This is Rae’s Four Patch Charm quilt and was made using my tutorial found here. 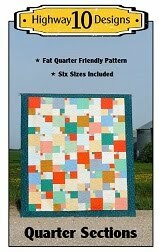 I love the blue and green batik fabrics she used and this quilt will be a raffle quilt at her church Bazaar in the fall. Hope it sells a lot of tickets! I quilted it the same as my tutorial sample and used Quilters Dream Blend batting. Here is a close up of the pebbles. I want you to see that I do cross over my lines sometimes and I don’t pick them out because you only see that when you look really closely. So be kind to yourself when you pebble, they look better once you’re done and are looking at the whole quilt, trust me on that. I did have to pick out a section of pebbles but that had to do with a tension issue and I’m glad I caught that before taking it off the machine. The backing is a Stonehenge grey/beige piece. 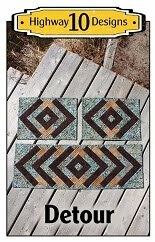 This weekend I whipped up a quick table runner using our Highway 10 Designs Lug Nuts pattern. It measures 20” x 52” so quite large but good if you have a large table. I used all batik fabrics and quilted it with feathers and swirls. Also made a bias binding to work the inner angles nicely. Our crazy weather continues and I’m now enjoying sunny 20’ temps for the next few days. So now that all the snow is gone I’m having some fun taking pictures in areas that have been buried under snow for the last 6 months. When I mentioned my favourite rock outcrop in a post a week ago there was request to see the whole rock so I’m happy to oblige. As you can see my whole Shack was built on this outcrop. Thought this last picture showed the layers well but then realized you can see another interesting feature that is common in our area that is running vertical. Can you see the parallel grooves? Those striations are created by advancing glaciers 8,000 to 15,000 years ago. They show the direction the ice was moving, the grooves were created by rocks and gravel at the bottom of the glacier being dragged across the outcrop. That’s your geology lesson for the day! Silly me for thinking we were going to have an early spring! Woke up Saturday to more snow and the lake frozen over again, these are not old pictures but from this weekend. Today is it raining so hopefully that will get rid of the unwelcomed white stuff! This is Kay’s Magic Tile quilt and she pieced it with all Christmas themed flannel fabrics. So I guess the timing of the new snowfall is all that bad, did make a nice backdrop for this quilt. But to be on the safe side I don’t think I’ll accept anymore Christmas/Winter themed quilts until next September! Kay always asked for a simple stipple on all her quilts, she loves that look so that is what I did. I used a sage green So Fine thread on top and a gold Bottom Line to match the backing colour. Please send warm thoughts my way to melt this quicker! I’m sure you are starting to see this quilt around the internet a lot and if not you will soon. 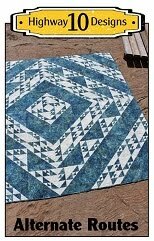 The pattern is called Gravity and it is by Jaybird Designs. This quilt belongs to the Manitoba Prairie Quilters, which is a guild located in Winnipeg, and this will be their Raffle Quilt for their Quilt Reflections Show on April 8 - 10, 2016. It was pieced by Joan Dupuis-Neal and she completed the quilt top in four days! And since it took me four days to quilt I guess you could call this quilt an eight day project! LOL…or maybe not! We were both doing our best to get this top completed on a deadline so the MPQ buy their raffle license and print their tickets. I am not a member of this guild, too far away, but if you are interested in tickets you can leave your email in the comments and I’ll forward your comment to my contact person in their guild. Tickets should be available sometime in June. So I’m going to warn you now, this post if picture heavy! Gravity is a large quilt, 96” x97”, and I was asked to keep the quilting light to keep within the guilds budget and that was no problem as I love light custom, that’s my thing as you know. So it took a bit of time to come up with the quilting designs and made a lot of those decision went I had the quilt on the machine. 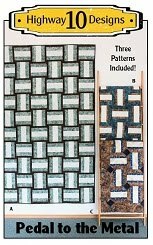 First thing I did was search online for inspiration and only found two completed Gravity quilts. One is the cover quilt on the pattern which you can see on Jaybirds blog here and the second was on Teresa’s blog Quilting is my Bliss which you can see here. I used elements from these quilt in the center designs and 95% of the quilting is done with rulers. For the background I know right away I wanted that to be a different style of quilting from what is in the center to really separate the two areas and allow the center to shine. This is the first sketch I came up with and it ended up being the final design. I wanted to have rays coming from the center but also echo the design and I think this was the perfect combination, giving it an overlapping feel. All the seams on this quilt are pressed open, which is a style of quilting I am not use too so I needed to avoid stitch in the ditch as much as possible. So out came the rulers, mainly my Quilted Pineapple Templates, love those curved rulers. This was the first time I tried the smallest one, the BFF, as I usually free hand small CC’s curve. But I loved how perfect it made the quilted curves look on this quilt as it is made entirely of solid fabrics. The guild requested that I used Mono Poly thread which I rarely use but in this case it was the perfect chose. It was the reason I could quilt this quilt so fast and I was pleasantly surprised how much I liked the final look, it gave it a bit of a shine too. I used a grey Bottom Line in the bobbin as the backing was grey. The batting is Quilters Dream Blend. One design element that you might not notice right away is that the six center diamonds are all quilted the same even though they are not pieced exactly the same. That gave the center a pleasant focus even though I wasn’t following the seam line on all of the diamonds. Here are some close up pictures of the quilting designs. And yes I was out on the ice this morning, just had too! It has been cool this week with below freezing temperatures at night so the lake ice is still thick enough to walk on off the end of the dock. So there it is and I know it won’t be the only one I quilt as a few of my quilting friends are making this quilt right now. 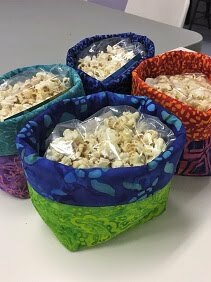 I hope this turns out to be a great fundraiser for the Manitoba Prairie Quilters and I hope to make it down for the show next year. 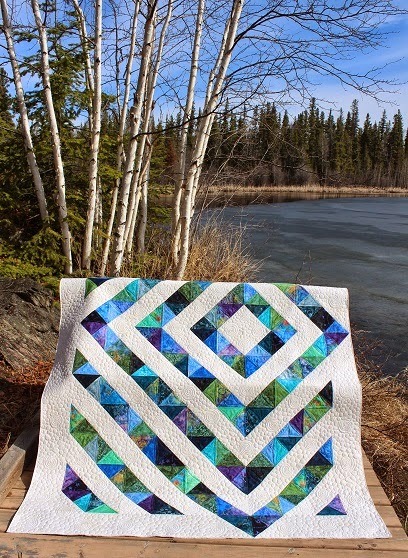 This is Ann’s Picture This quilt and she purchased it as a kit from the Sugar Pine Company in Canmore, AB. 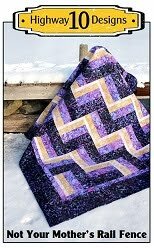 I just happen to have this pattern and it is in the book Happy Hour by Atkinson Designs. I love the colours of the batiks in the cover quilt and it looks like Ann does too! The blocks are 14” so over sized and if you have fabrics with a larger print this pattern is perfect for using those fabrics. Ann sent a beige Fireside backing, I used Quilters Dream Blend for the batting and the panto is Fascination. Medium brown So Fine thread on top and a light beige Bottom Line for the bobbin thread. I love the border fabric she chose, look at all the potential quilting design in the print! I was looking at pictures on my blog from last April and can’t believe the difference in the amount of snow on the ground. The snow is almost all gone now where as last year we still had a lot of snow on the ground. The ice is now turning grey and we have water along the edge of the shoreline so it is nice to see we are going to have an early spring! I have my outcrop to use as a backdrop again, I love this rock and many people who come to visit us comment on how eye catching it is. Its always nice to have an opportunity to put my geology degree to some use and be able to explain the process of how the rock formed! Not too many quilters have a studio build on a 1.9 billion year old outcrop of a pyroclastic flow from Precambrian volcanoes…unless you live in my neighbourhood! Don’t worry, I won’t bore you with any more geology talk…I can’t remember much more than that anyway. So this is Marg’s Pedal to the Metal quilt, she made a second quilt out of the left over fabrics she bought for the one I quilted for her last week here. She bought extra fabrics when she made quilt “C” and had enough to make quilt “A” from the pattern. Then today she showed me the third quilt she is putting together with all the bits and pieces she had left over from this quilt! She really knows how to stretch out those left over pieces! This time I used Mimosa for the panto, brown So Fine thread and Quilters Dream Blend batting. This was our view yesterday, its raining today, so I’m sure we have more open water now. And this is how it looked last year at this time! The snow was still up to the top of the dock and we had two feet of snow by the Shack.